With all the talk of Kickstarter these days and how it’s enabling creators in ways never thought of before, I thought comparing animated Kickstarter projects would make for a good blog post. 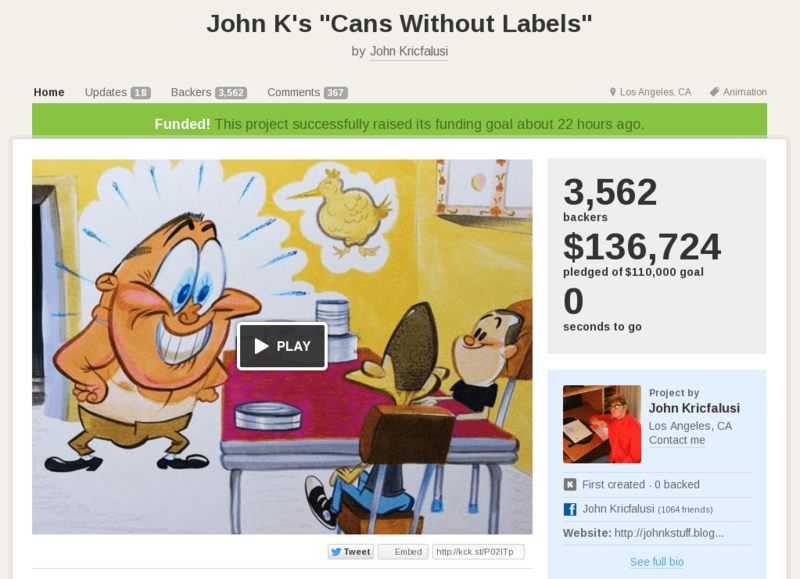 The three in question are John K’s Cans Without Labels, Vegtoons and Lunatics. All represent the goal of getting something animated in production, but all three take a different approach to the Kickstarter process and their ultimate goal. The goal is to create an animated cartoon, naturally, but while Cans Without Labels and Lunatics focus more on the entertainment side while Vegtoons is more evenly balanced between entertainment and education. So far so good. Where things really start to differ though, is what each project hopes to use the funds raised for. Cans Without Labels and Vegtoons will use them to actually create a completed cartoon. That’s things like the animation, backgrounds, sound, music and so forth. Both projects have their voices recorded already. Where they diverge is that Cans Without Labels is a once-off (at least for now). 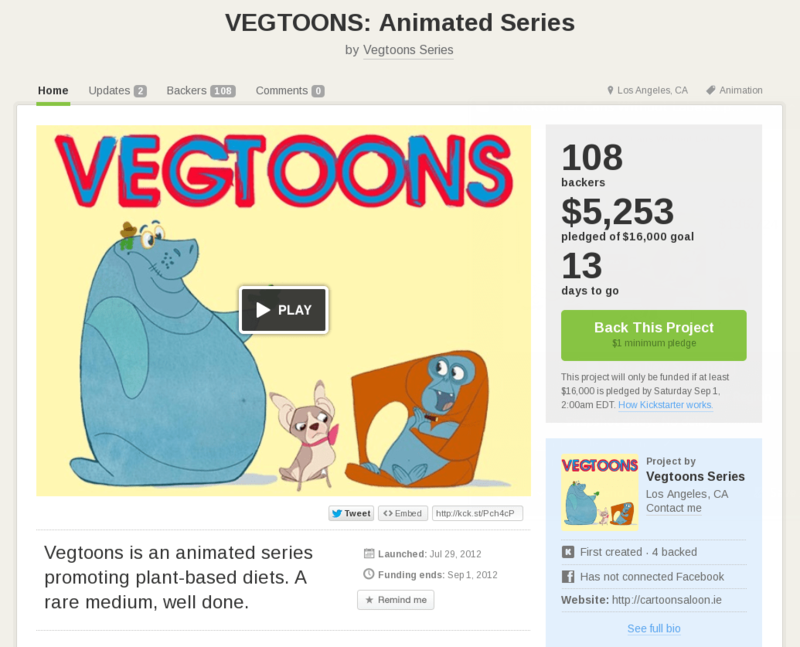 In contrast, Vegtoons aims to be an entire series. The aim here is to fund the first episode through Kickstarter and then use that as a proof-of-concept for an investor to take a chance on a full-fledged series. As you can probably tell, I haven’t mentioned one yet. That’s because the Lunatics project is by far the black sheep. Instead of raising money to create the vast bulk of the project, the creators are instead asking for only enough to complete the next stage of the production process. In this instance it is the voice tracks and the animatic, both of which are fully budgeted in the description. This kind of piecemeal approach may suit independent projects like Lunatics which can’t benefit from the celebrity and experience of John Kricfalusi or the studio and talents of Cartoon Saloon. The context for all three projects are also relatively different. Cans Without Labels is meant for entertainment plain and simply. Vegtoons aims for a mixture of entertainment mixed with education and Lunatics is primed for entertainment but with a heavy leaning towards the “what-if” theory. Clearly we have three different projects gunning for three different audiences. That speaks to the value of Kickstarter in providing a platform for a variety of projects. Now obviously something that is pure entertainment like Cans Without Labels will fare better for the simple reason that it appeals to a wider audience, but for the other two, Kickstarter provides an even platform on which to attract potential backers. This is where things get really interesting. All three are aiming for the same ultimate goal, but all three believe that the cost to get there will be different. Vegtoons reckons they can complete a full episode for about $20,000 (they’re asking for $16K to complete the first episode). Presumably that’s for an 11 minute cartoon in the style of flash animation we’re all used to on TV. Lunatics is asking for just $4,235 although that covers only part of production. An original Kickstarer project attempted to raise $100,000 for a complete episode but was unsuccessful. As noted in the current project’s description, that was perhaps a bit of an adventurous goal for a small, independent project. As a result they have re-launched with the piecemeal approach and appear to be having much more success raising the necessary funds. Cans Without Labels blows both out of the water with its $110,000 budget (and $136,724 raised). In contrast, to the other two projects, this is for a single cartoon, Both Vegtoons and Lunatics are aiming for a series (with the latter actually aiming to squeeze two episodes out of their original budget). Will the quality differ? Undoubtedly, but with all the modern technology at people’s disposal, it does seem to be hard to justify a budget of a hundred grand for a single cartoon. Vegtoons will use Flash and Lunatics is aiming to use as much open source software as they can to keep costs down. Although two of the projects are ongoing at this point in time. It is clear that two of them are focusing on the people associated with the projects (John K. and Tomm Moore) while the third is choosing to focus more on the goals and results. Not to say that the first approach is wrong (it’s the reason Disney made sure his name was present on every film he made), but in particular with Cans Without Labels, its easy to choose style over substance.